Savills latest report Residential Leasing Briefing Q1 2018, indicates positive rental growth for C5W over Q1 2018.
Credit: Photo by George Kedenburg III on Unsplash licensed under . Q1 2018 saw positive growth in all five Inner North and Inner East Wards. While the C5W led rental growth in Q1 2018, every submarket, including all five of the Inner North and Inner East wards, saw positive quarterly growth. Average mid-market asking rents in Tokyo's 23 wards (23W) stood at JPY3,791sq.m. up 3.1% QoQ and 3.4% YoY. Average asking rents in the central five wards (C5W) stood at JPY4,530sq.m., up 3.3% QoQ and 6.4%YoY. The Inner East wards posted a QoQ gain of 2.6%, the largest quarterly gain of all submarkets outside of the C5W, and a YoY gain of 3.7%. Average occupancy rates for institutional-quality assets are steadily climbing towards 98%. 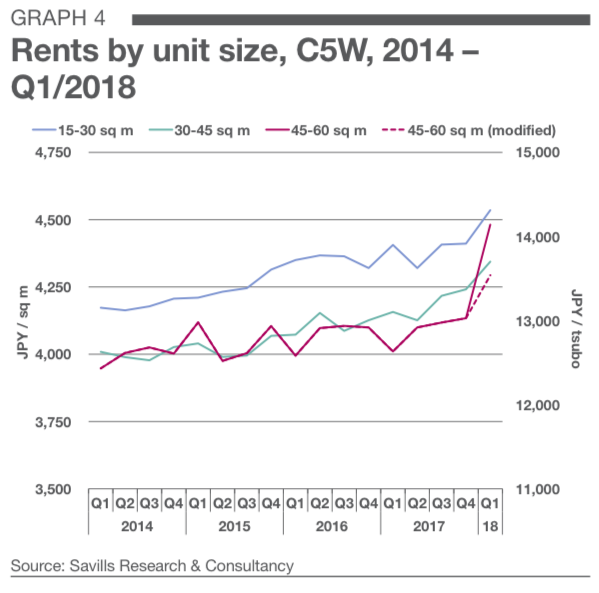 "Rental growth in the C5W has continued to increase, with average rents overtaking 2008 levels for the first time since the financial crisis. Outer wards continue to see gains, with all submarkets posting positive quarterly growth, as occupancy rates push steadily towards 98%." - Savills Research & Consultancy. properties located in Tokyo's 23 wards and situated within a ten-minute walk of the nearest station. In contrast to the luxury residential market, advertised or 'asking' rents for mid-market units fitting the above criteria are typically non-negotiable and are not subject to incentives such as free-rent periods. Savills mid-market rental indices are therefore considered to closely reflect movement in contract rents for the Tokyo market. Tokyo rents have extended 2017's upward trend into Q1 2018, with the 23W average reaching JPY3,791sq.m., an increase of 3.1% QoQ and 3.4% YoY. 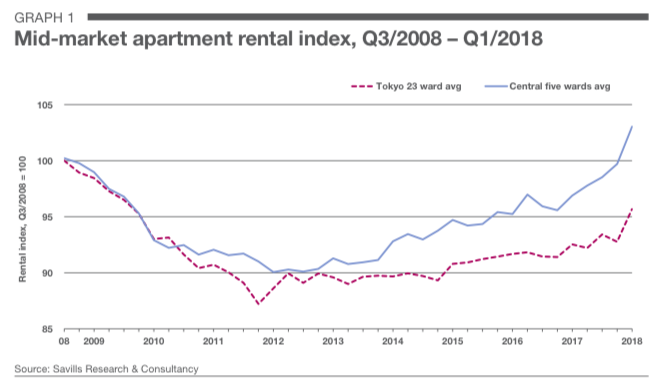 Through rental increases in the C5W significantly outpaced those of the 23W throughout 2017, overall Tokyo rents have gained ground, pushing to over 95% of their 2008 levels while all submarkets have seen positive QoQ rental growth. Following strong growth in the C5W throughout 2017, rents in the area have reached JPY4,530sq.m., exceeding 2008 levels for the first time since the financial crisis. Continuous completion of high-end, mid-sized residential units is driving growth in the area. In particular, listings of high-end apartments completed in late 2017 and early 2018 are a major driver of Q1 2018 rental prices. While new developments are primarily in the 15-30sq.m. unit range, some notable new properties are offering 30-60sq.m. units. For instance, Mitsui Fudosan added 68 units to the Shibuya, Chuo, and Chiyoda markets from November 2017 to February 2018 through its park Axis series. During Q1 2018, dozens of these units, sized around 30-60sq.m., were still leasing an average of JPY5,600sq.m., though Shibuya units were leasing for well over JPY6,000sq.m.. Zoom Jingumae, which was completed in November 2017 in Shibuya, was offering units between 30-35sq.m. for rates averaging just under JPY5,900sq.m. These new developments may be responding to demand from dual-income households that are prioritizing high-specification apartments with convenient access to office locations rather than increase space. Overall, give the small sample size, particularly in Chiyoda, high-priced outliers significantly drove up the C5W average for the quarter. Though it is very likely that there will be some downward recoil in average rents as these outliers move off the market later this year, steady growth trend is expected to continue. Rents in the C5W are continuing 2017’s rapid growth trend, with Q1/2018 seeing an even larger spike. Due to high-priced new supply, the average rental premium for property in the C5W over the city average has grown to 19.5%, up from 11.3% in 2010. While there may be some pullback during the year, the premium is likely to continue its gradual upward trend given the area’s ongoing redevelopment. Comparing the year-to-date average submarket rents to their prior-year averages, all but one submarket outside of the C5W have lowered their average rents relative to the 23W average. Though the Inner North wards have outperformed the 23W average since 2014 and exceeded the South Wards in 2017, average rates have fallen 30bps below the 23W average for the quarter. 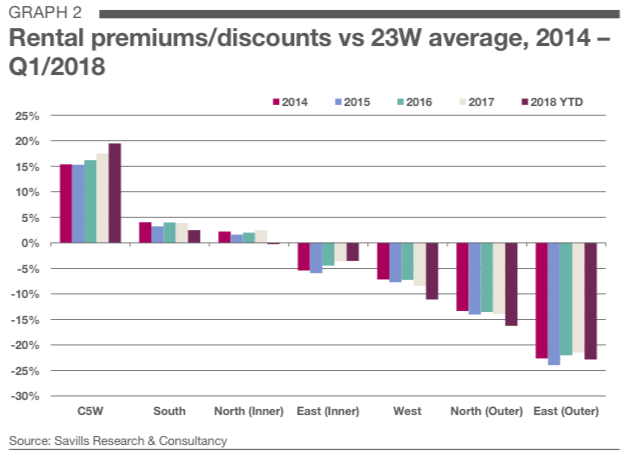 Similarly, the Outer East wards, which have been reducing their annual average discounts since 2015, saw a drop of 140bps compared to the 2017 average. The West wards continue to extend their discount, falling a whopping 270bps. The South wards dropped 140bps, though remain 250bps above the 23W average. The Inner East submarket, however, remains virtually level after narrowing its discount by 90bps in 2017. The large number of new mid-market developments in the C5W may be having an outsized impact on the 23W average for the quarter. As a result, despite seeing average rental growth for the period, most submarkets have grown at a slower rate than the 23W average. Indeed, the C5W submarket continues to have the strongest growth, 6.4% YoY and 3.3% QoQ, further expanding the 2017 trend. Growth in the area was led by Chiyoda, which posted a whopping 9.6% increase YoY and 6.3% increase QoQ. Decreased household size and urbanisation continue to fuel growth in the area, with an increasing number of studio and one-bedroom apartments entering the market. Limited land for residential development and increased construction costs are leading developers to focus on building compact, high-end units, which in turn drives up rental prices per sq m.
The South submarket continues to see rental growth, with a YoY gain of 3.1% led by Shinagawa at 7.1%. Located on the southern border of Shibuya and Minato, respectively, the area offers convenient access to Tokyo’s CBDs with a significant discount compared to the C5W. The Inner East submarket has seen a notable increase of 3.7% YoY, led by Taito, which posted a gain of 4.6%. Bordering Chuo and Chiyoda to the northeast, Taito provides convenient access to central Tokyo at even lower prices than the South wards. The market is likely driven by middle- income tenants seeking larger spaces. Tokyo’s average rent continues to trend upwards, as all submarkets posted quarterly gains. While the C5W has clearly pushed much further ahead than the rest of the 23W, outlying areas have been attracting more tenant interest than before. Tokyo’s rental market is principally made up of compact single-occupier units, typically less than 4sq.m. (13.6 tsubo) in size. Such units can often make up as much as 75% or more of the 23W area’s rental listings. Unlike other major global cities such as London and New York, house or apartment sharing does not form a major segment of the rental market. As a result, there is a large, stable market for small- to mid-sized units. Rates in the 30–45 range have grown steadily in recent years, now standing at JPY4,344sq.m. The 15-30sq.m. range has seen similar growth over the same period and now sits at JPY4,535sq.m. Rates for 45-60sq.m. units have spiked to JPY4,481 for the quarter, driven by a significant introduction of new units to the market. The Park Axis Omotesando Residence, completed in November 2017, offers 45–55sq.m. units for around JPY6,300sq.m., with the most expensive unit going for just under JPY7,700sq.m. The Park Axis Iidabashi Residence in Chiyoda was also offering 45–50sq.m. units for over JPY5,500sq.m. Mirea Court Ginza Premier, which opened to tenants in March, offers 53 units ranging 40–85sq.m. Dozens of 40–50sq.m. units were listed with asking rents averaging just under JPY5,600sq.m. Excluding the above listings, the average for 45-60sq.m. units would stand at JPY4,294sq.m. (see “45- 60 sq.m. (modified)”). This modified figure is more likely to show the actual growth trend. Average occupancy rates in Tokyo are climbing steadily towards 98%, with the current 23W average reaching 97.5%. This is 0.3ppts higher than the prior-year period and 0.5ppts higher than the prior quarter. The C5W also increased occupancy by 0.5ppts QoQ and 0.7ppts YoY to stand at 97.2%. The Outer North submarket is still seeing the strongest occupancy at 98.9%, though all surveyed submarkets but the West are showing between 97% and 99% average occupancy. Shinjuku has seen the most substantial tightening of the C5W, with average occupancy reaching 97.6%, an increase of 1.9ppts QoQ and 1.1ppts YoY. Occupancy in the ward has now surpassed that of Minato, which currently sits at 96.4%. 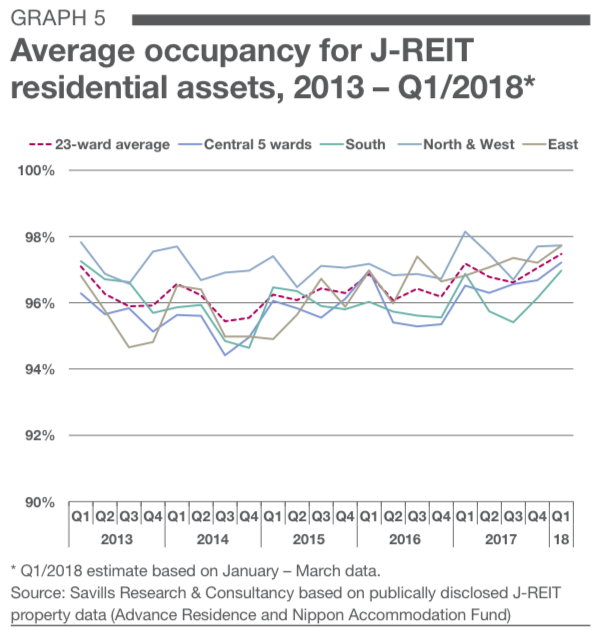 High demand for institutional-quality assets shows no sign of slowing, as occupancy rates continue to rise steadily across the 23W, with 19 wards showing further tightening QoQ and 18 wards posting increases YoY. The market is expected to remain strong as a robust economy, high condo prices, and infrastructure development all contribute to leasing demand. Building on the above-trend growth in 2017, Tokyo's residential rents spiked in early 2018, led mainly by a larger number of new, high-end properties listed in the C5W. Driven by multiple new completions from late 2017, the C5W average has exceeded 2008 levels. Though this quarters growth is largely in line with 2017's overall trend, the exceptional rate of increase over Q4 2017 indicates that this period is an outlier. Savills expect the overall growth trend to proceed steadily, albeit with some recoil following Q1 2018's exceptional increase. Growth in rents throughout the 23W has continued in earnest. While most submarkets failed to outperform the 23W average for the quarter, they continue to build on 2017 gains, with notable strength in the Inner East submarket. Continuous redevelopment in Tokyo, particularly in the C5W, is driving rental growth throughout the area. If the current quarterly rate of growth were to continue, the 23W average would surpass the 2008 levels by late 2018. However, based on historical movements, it is much more likely that we will see some contraction in the growth rate as this period has seen exceptional growth. Even so, it now appears more likely that the 23W average will surpass 2008 levels by 2020. Increases in maintenance fees may present some concern for buyers and tenants in the residential market. Asking monthly management fees appear to have increased in line with maintenance fee increases. For now, prospective tenants of mid-market apartments appear to be accepting these higher rates. Occupancy is pushing steadily towards 98% and is unlikely to weaken in the absence of a new supply glut. Increasing urbanisation, coupled with limited opportunity to acquire land for residential development, should continue to bolster Tokyo's rental market. If global economic uncertainty persists, negatively impacting capital markets, mid-market residential properties in Tokyo may become more attractive to investors. Click here to view Savills Briefing - Residential Leasing Q1 2018. For more information about the report email Tetsuya Kaneko from Savills Japan via the contact details listed below.